As with any sequel, you’ll need to have read my previous blog. “Emily-less”, that’s to say “volunteer-less” and with two deadlines approaching (the first of two operations on my wrists and our wedding, both in September) we have a huge pile of stuff to do. Every morning begins with me waking first, taking Gabrielle a cup of tea and then getting all the animals up and about and fed, during which time, she rouses herself and has breakfast ready for when I come in. Breakfast is often now followed by a “meeting”. Over a strong coffee, we plan and try to prioritise what we’re up to. We’d got carried away with what a volunteer would bring to our lives and were now just left alone with our unfeasible “list of things to do”. “Can’t see the wood for the trees?” could apply to my inability to see the volunteers for the neighbours. Alan and Tangui to the rescue! Alan and Carole have a wood-burning stove, which obviously needs sticks for starting fires and logs for burning. They also wanted some wood chippings for the path in their vegetable garden. 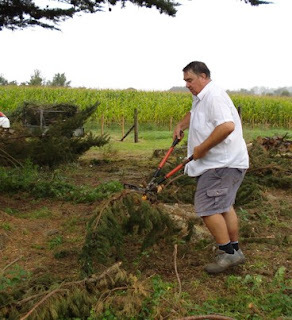 An elegant solution proffered itself: Alan chops, chips and removes all the prunings left by Duncan the tree surgeon (see my blog of August 7th) gaining chips, kindling and logs and our building plot gets miraculously and meticulously cleared, as if by some woodland fairy. Meanwhile, on the other field, Gabrielle was chomping through more of Duncan’s offcuts when the affable and willing (and perhaps slightly bored at the end of the school summer holidays) Tangui offered his services. Should we be taken to task for exploiting child labour? Nah! 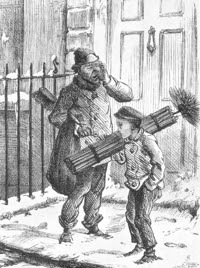 I think the Victorians had it right: why pay good money for a sweep when you can throw a young child with a brush up the chimney! So, with many hands making light work, we’ve caught up some time, thanks chaps! What is the structure with a blue door in the hanger behind Tangui? Thanks for the comment. 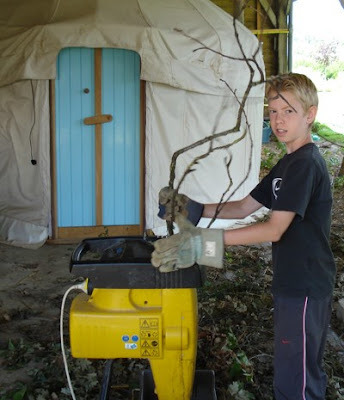 The structure with a blue door is our yurt, made of a waterproof canvas cover stretched over a frame made from coppiced ash. 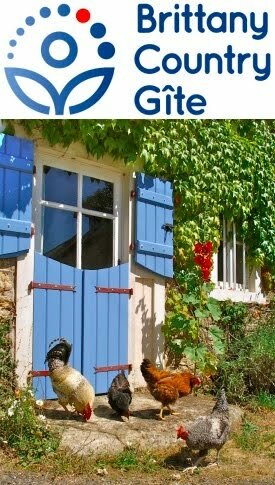 The blue door was a reclaimed outside toilet door, bought from Brighton & Hove Wood Recycling Project, when we used to live in England. We'd put it up as we had friends with kids come to stay.